Somewhere in London is an atom bomb, and terrorists are holding the city to ransom lor a total of five million pounds. The Prime Minister has decided not to give in to the terrorists'demands but lias instead sent you to find and defuse the bomb - due to detonate in twelve horns, taking most of London with it..
GACed by the same author as Panic Beneath the Sea (reviewed AA51), City Is a better game. The scenario still isn't very original although the actual game is well written. As with most GAC games the graphics aren't anything to rave about, but as always they can be switched off if you want. 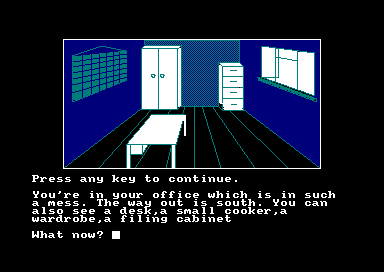 City is a good, logical adventure which should appeal to most. 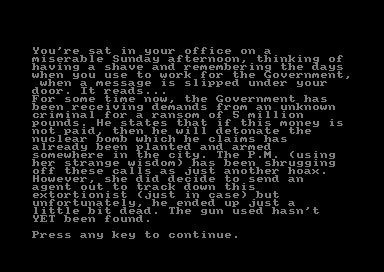 The Balg's version of City (or Ransom had some minor bugs, but John assures me that they have all been rectified. Overall, it's well worth the asking price of £2 but it doesn't have any major selling points.